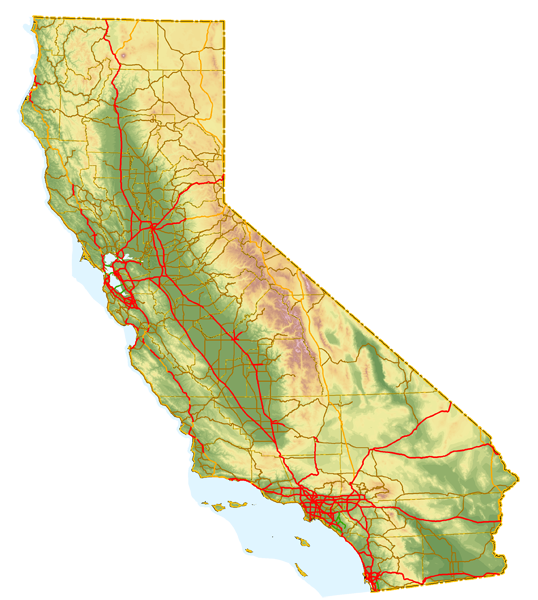 California, like several other states, has the definition of each of its signed routes, whether Interstate, U.S., or state, listed in its legislative code. All routes are listed in Streets and Highways Code Sections 300 through 635. Not all of the routes listed in the Streets and Highways Code have been constructed. The Code further identifies which routes are to be considered freeways and official scenic routes. Certain sections of some urban state routes are locally maintained by cities and/or counties, and those instances are usually identified in the Streets and Highways Code. We have prepared a table of all of the state’s signed routes, listed in order from 1 to 980. Most assigned routes are between 1 and 299. Several of the routes are unconstructed; they are identified as such in the table. Just because a route is listed as unconstructed does not imply that the route will be constructed. It is entirely possible that future legislation will alter, truncate, or eliminate these unconstructed segments. Other routes may be locally maintained or signed as another route; those instances are also identified. California Route Log (PDF) as compiled by AARoads. Please note that there is no affiliation between AARoads and the State of California. Page Updated May 27, 2005.